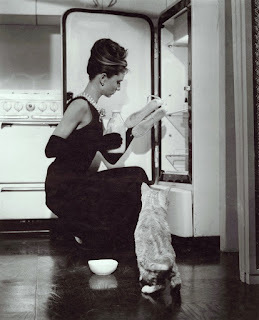 For most people, this is the image they think of when they think of Audrey Hepburn in a kitchen. 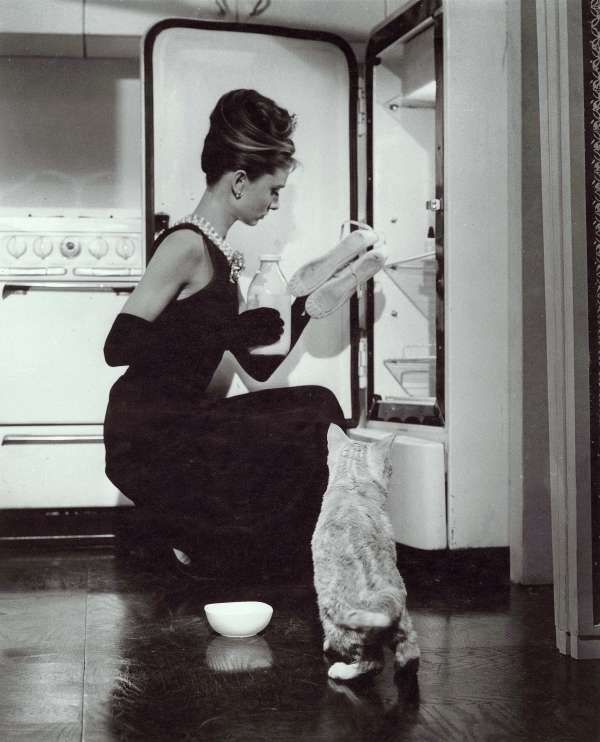 Holly Golightly in full tiara examining the contents of her refrigerator: milk and ballet slippers. 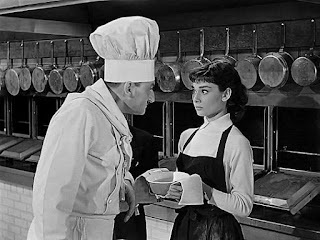 Really, to look at Audrey Hepburn one might never think she ate a bite. Such a supposition has a rather sinister truth. As a child in war ravaged Holland, she suffered from acute malnutrition and came very close to starving. Some twenty-two thousand people died of hunger in Holland during World War II. We also think of Audrey Hepburn as a movie star. Her son, Luca Dotti, says he never knew Audrey Hepburn, and vehemently denied that his mother was an actress telling those who inquired that his mother was, "Mrs. Dotti." "For in the kitchen, as in life, my mother gradually freed herself from everything that was superfluous to keep only that which mattered to her. Those are the recipes you will find in the pages that follow -- and the stories that go with them." As one might suspect, the vast majority of the recipes are Italian. One might not suspect that Audrey Hepburn was a fan of junk food. Here is a recipe that combines the two. She often ate this sitting in front of the television. Cook the penne in a pot with abundant slightly salted boiling water; strain when it is "al dente." In the same pot over medium heat, toss the pasta with the butter and oil, mixing for a minute or two. Turn off the heat, cover the pot and wait a few minutes more; this is called "mantecare" and leaves your pasta as smooth as silk. Pour the penne into a serving bowl and toss with a splash of ketchup, just enough to give the pasta a pinkish color. Dot the top here and there with a little more ketchup. Serve with grated Emmentaler cheese. If you are a fan of Audrey Hepburn, this is a magical book to add to your collection. 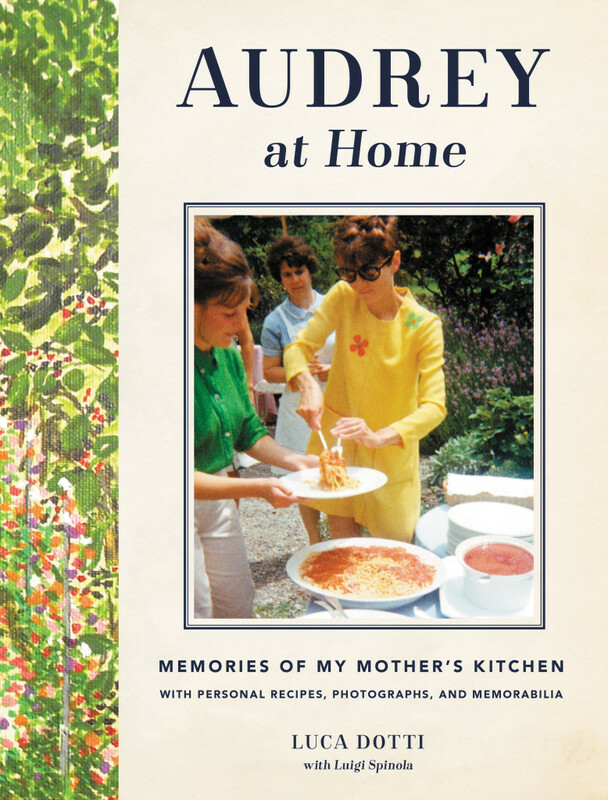 Here a few "extra" photos we have of Audrey in and out of kitchens real and imaginary. 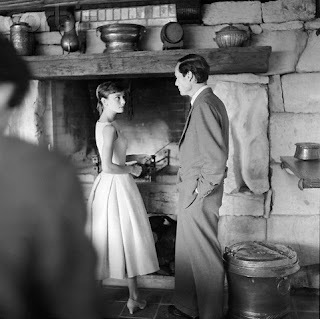 Audrey Hepburn with Mel Ferrer in the rustic kitchen at their home, Villa Bethania. Audrey in a California apartment. 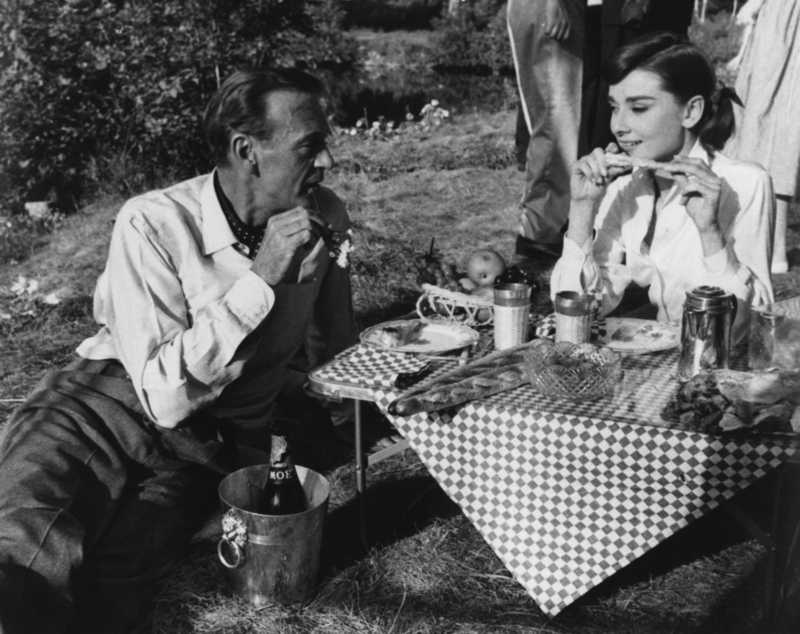 Gary Cooper and Audrey on the set of Love in the Afternoon. Was that a thing in the 60's? I remember my mother, who was an excellent cook, occasionally using ketchup with pasta. Well, I thought it was funny, but as I read the recipe, I thought it might be worth a try. In Italy, they sauce pasta with a small amount of sauce, not those huge quart-like jars In the grocery. So a bit of nice organic ketchup and lots of cheese might be fine.